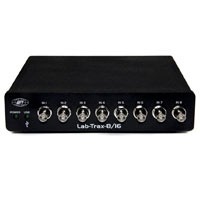 LabScribe is the powerful data acquisition software included with Lab-Trax™ (formerly DataTrax). The acquisition and data display in LabScribe is easy and straight forward. It supports real units and a time-based display that is not coupled to sample rate. You can display up to 1,000,000 data points per channel on the screen. Scrolling, zoom-in and zoom-out tools, together with a searchable list of user interventions, make finding important areas of data easy. And, of course, you can print or export anything that you see.